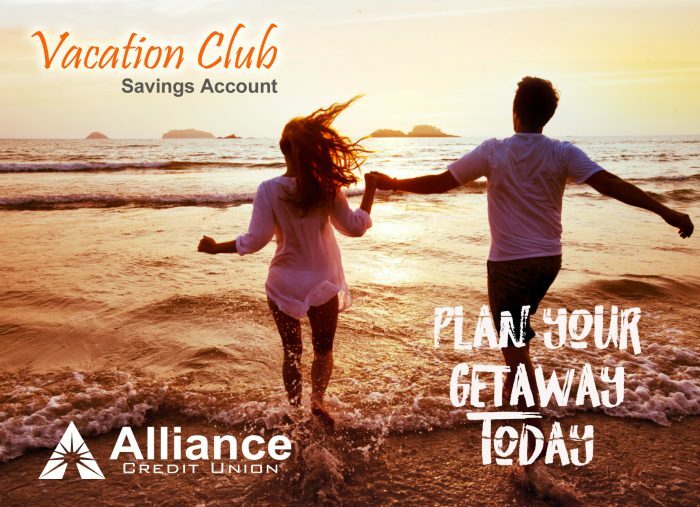 Plan ahead for your next vacation by opening an Alliance Vacation Club Savings Account today. This account allows you to save cash year-round for all the expenses that come with traveling to your destination. When you automate your savings with payroll deduction or automated transfers from another account, building your balance is easy. And your funds, plus interest, can be automatically transferred to your checking account when you are ready for your getaway! Open a Vacation Club Savings Account at any time of the year with only a $5 minimum deposit. Your account begins earning interest once your average daily balance for the month reaches $100. We suggest opening your account with $100, so you start earning interest right away. If you need assistance figuring out how much money you will need to transfer into your Vacation Club Savings Account each month to reach your savings goal, check out our Savings Goal Calculator. Using this calculator will help you project how long it will take you to meet your savings goal based on how much you are able to put into your account each month. Questions about opening your Vacation Club Savings Account? Call us at 636-343-7005, option 0 or visit any branch to open your Vacation Club Savings Account today!